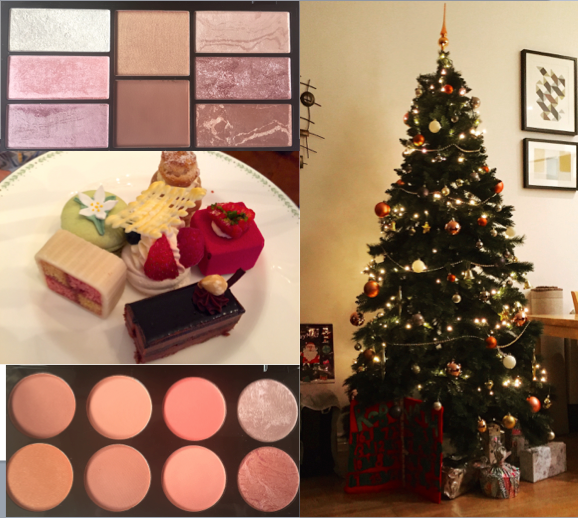 Weekend wind-up: Afternoon tea, new blush palettes from the high street and feeling Christmassy! This week has been a very busy one with work. I've been out a lot in the evenings and working over the weekend. Nevertheless, I've had time to put my Christmas tree up! It look's so pretty! This year, I went for a copper, grey and white theme. I got some new baubles from christmasstyle.co.uk . They were very reasonably priced but I did have to sit and tie on ALL the strings (why do people make bauble without them- I ask you!) This took a long time but I'm very please with the result. Last weekend, I went for afternoon tea with my sister in Harrogate, Yorkshire. We went to Betty's tea rooms which I have wanted to go to for a long time. I wasn't disappointed. I wrote a review here with lots more pictures and info about our afternoon tea experience. I thoroughly recommend it! I also did a blogpost on two new blush palettes I have been trying out from the drugstore (Superdrug). Since purchasing the Hourglass ambient lighting edit I wanted to see if I could find a dupe/ cheaper alternative. I wrote a post all about these two from makeup revolution and freedom and you can see which one I prefer here. How are your Christmas preparations going? Have you bought any presents yet? I have to say (smug face) I am feeling quite organised this year, I did quite a lot of Christmas shopping last weekend and only have a few bits and bobs/ stocking fillers to get!